That's right. Baby number 2 is on the way! We'll be adding another little human to our brood in early October/late September, and we're so excited! Knowing that our lives are about to get more hectic (and more wonderful), it was great having this time to simply enjoy each other without any interruptions or early wakeup calls. 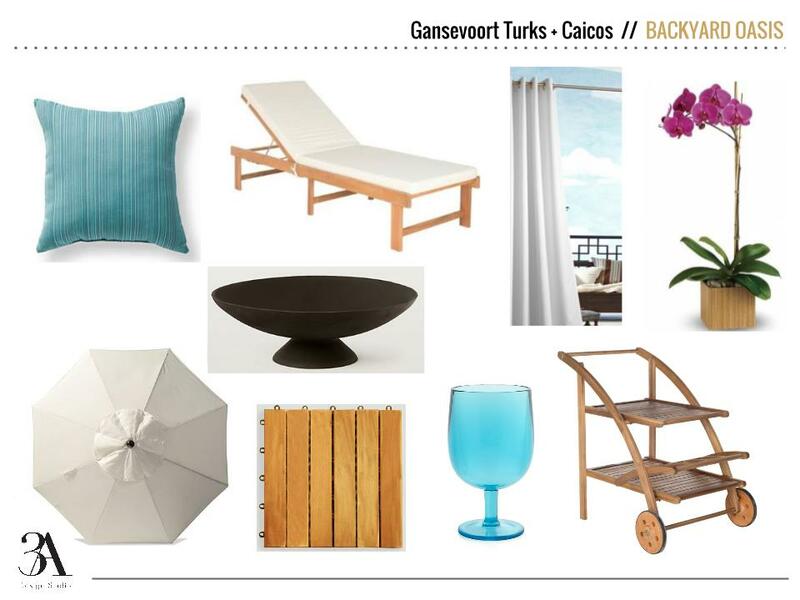 The Gansevoort Turks + Caicos was the perfect spot to do just that. The beach was something you can only dream of and the pool was a little slice of heaven. It's easy to see why we didn't want to leave, isn't it? The pool area was a favorite of mine. The mix of white, aqua and wood was done so well and the palm tree and flower backdrops just made it perfect. But if you can't get to paradise yourself, you can create your own backyard oasis with these items. As I mentioned a few posts back, we are re-doing our backyard. We have a good size yard but it was very shady and the mosquitoes would eat us a live within a minute of being out there so, we hardly went out. We also had a water drainage issue from the yard being so un-leveled, no grass, and the fence was falling apart. Here is what is looked like before. The yard really opened up by cutting down a tree, moving a couple trees back near the fence , and removing the small side fence that the previous owners installed. A newly installed patio also made a big difference. A good pressure washing to the fence did wonders. My golf loving hubby and my brother installed a small putting green where the playground used to be. If you are interested in creating one, these are the instructions we followed. Though we are not quite done, it has been so nice to finally enjoy our backyard. My daughter and her friends have played soccer in the grass a few times. Our nephews have had fun on the putting green. The baby and I have been able to sit out on the back and get some morning sun. We have even had dinner on the patio and surprisingly the mosquitoes haven't been bad. I am not sure if its just because it is early in the season or if having less shade in the backyard has helped cut down on the mosquitoes. We shall see. The next steps are putting up a hammock I bought a few years back, installing plants, and building a fireplace. I will continue to update you as we progress. If interested, below are links to the cushions and dining set I bought, along with a few other items I plan to purchase to finish off the look.